The 1982 Malvinas war had 74 days of duration and 33 fighting days. It had a code name Operación Rosario for the Argentines and Operation Corporate for the British. It took 746 Argentine lives, 255 British and 3 inhabitants of the islands (9) It was certainly no picnic. 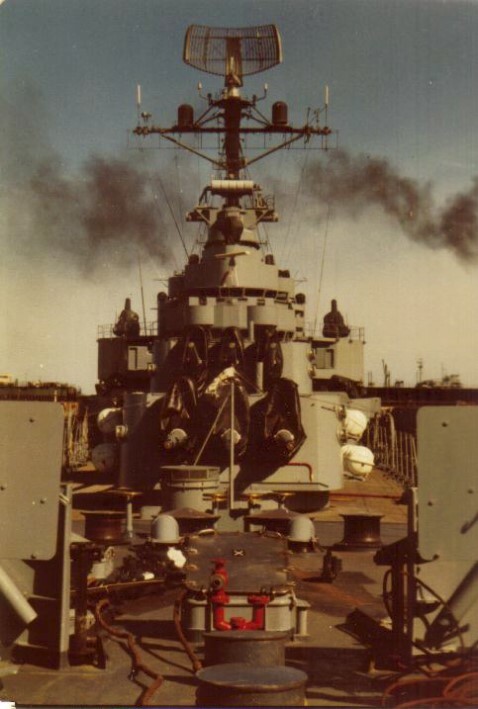 The total amount of deaths produced by the sinking of the cruiser ARA ‘General Belgrano’ represents 50 per cent of all the Argentine casualties in the conflict. Thirty per cent were 18 years old conscripts (14,37,38) . Tables 1,2,3,4,5.6,7.8.9,10. The Royal Navy paid a terrible price. Five British ships were sunk and at least twenty others hit. Eighty per cent of the British losses were due to the Argentine Air Naval Task Force (8). Mount Longdon, Mount Tumbledown and Goose Green were bloody ground battles which ended with fixed bayonets and hand-to-hand fighting (5,6,10,11,39) Fourteen per cent of casualties were due to trench foot (15). About 73% of the patients assisted at the Puerto Argentino Military Hospital presented gunshot wounds in their limbs (6). 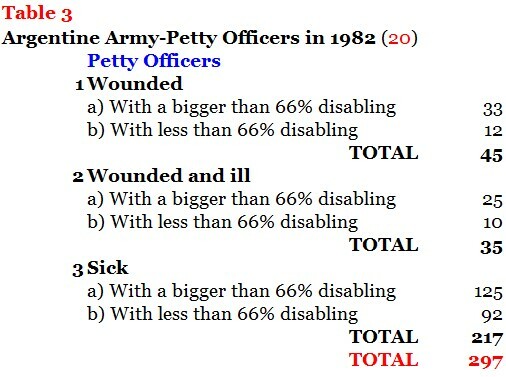 About 53,3% of the British with combat wounds were due to high velocity bullets (6). 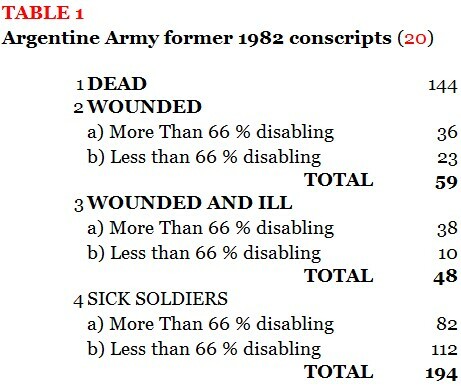 About 40 % of the surgery made by the British was done in Argentine soldiers (6). Since 1982 there has been 264 Argentine veterans and more than 100 British veterans committing suicide. A research made in 1995 with Argentine war veterans showed that 58% experienced depression episodes related with the conflict ,and 28% had ideas of suicide (33) . Between 1990 and 1998, 150 people were discharged from the British forces for Post traumatic stress 43 . An update is being presented. The Argentinian government had claimed the Islas Malvinas since Argentina achieved independence from the Spanish in the early 19th century. Argentina had a settlement on the islands in 1826. Most of the settlers were expelled by the USS Lexington in 1831 and a British expedition took control of the territory in 1832. British sovereignity was declared in 1833. There were 150 years of arguments and protest. Dr Scheina wrote in 1983 ´ The most persistent error concerning the Malvinas dispute is the belief that the problem had its origin in the recent past. Some have suggested that the Argentine Government was trying to divert attention from the country monetary inflation. And the commonly hold notion is that the invasion to the Malvinas was intended as a mean of forestalling a nationwide labor strike. Simplistic misconception such as these can lead to erroneous conclusions that the status quo has been restored and the problem solved. In fact neither is true´ ´ The war was caused by an unanticipated series of events heaped upon years of frustration´ ´ Few wars can be scheduled, most must be fought with what is already on hand or immediately available´ (37) More than a 100 books have been written, medical articles, poems, films, a military march, T-shirts, decals and even a video war game called Malvinas 2032 (22). The Chilean Armed Forces aid to the British was well depicted by former tory Rupert Allason ( Nigel West ) in his book ´The secret war for the Falklands´ ( Clarín, October 23rd,1998 ). The conflict had a profound effect on the lives of ordinary men and women, particularly the service personnel involved in the conflict and the families they left behind. Even those who were not wounded physically found that they had changed on their return home . The anchorage area became known fittingly as ´Bomb Alley´. 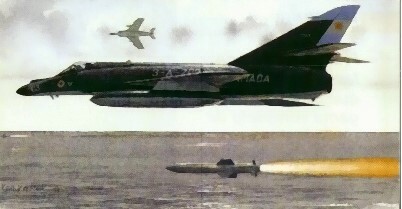 An A4 Skyhawk of the Third Naval Attack Squadron flows at low level to attack and sink HMS Ardent . HMS Argonaut and HMS Brilliant were badly damaged. Argentines lost two planes. R.G.Smith had a special affection for the little A4 Skyhawk. The superb painting was the front cover of the Proceedings-May 1983 - It was kindly authorized by Sharlyn Marsh, daughter of late artist R.G.Smith, and Carol Mason Director of Member and Customer Services - US Naval Institute. Upper left corner CSEN Oscar Guzmán.Upper right corner CSEN Roberto Daniel Borello. On May 22, at 08.00 AM the small Z-28 class coastguard PNA GC-83 ´Rio´Iguazu´ was transporting up to Darwin port two 105 mm OTO Melara Pack Howitzers from the Nº 4 Airtransport Artillery who were reinforcing the Nº 12 Infantry Regiment in Goose Greeen. There were as well 20 Army men under the orders of a Second Lieutenant. The Rio Iguazu had only two 12.7 Browning machine guns in stern. 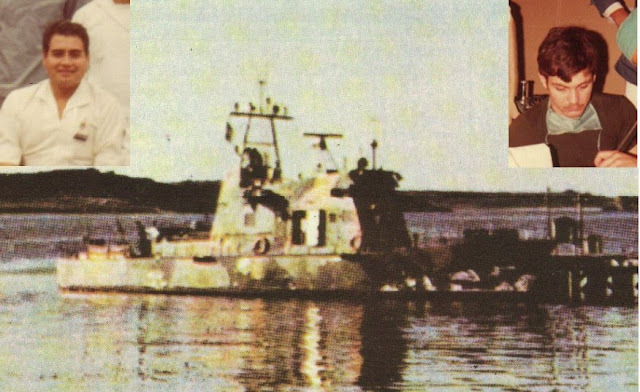 The crew was composed by 15 members of the Coast Guard, and Guzman, a Corporal male nurse of the Navy which belonged to the Azopardo Naval Arsenal. 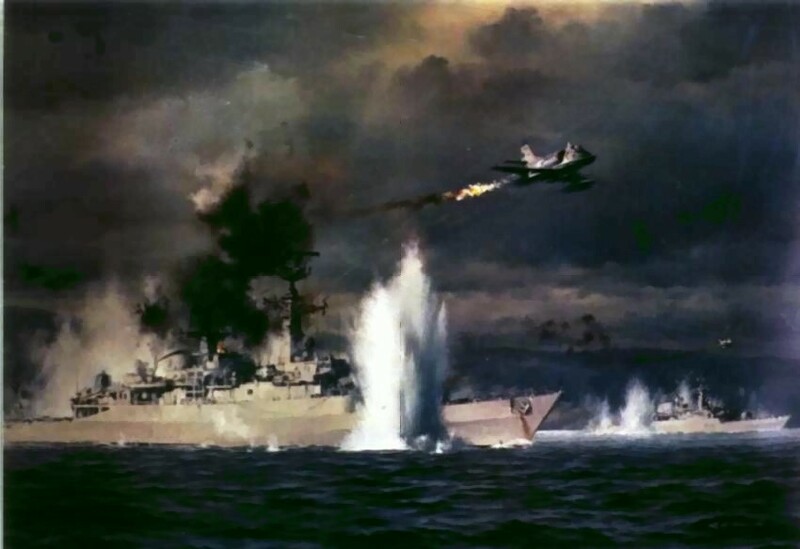 They were attacked by two Sea Harriers who fired their 30 mm guns and unsuccesfully bombed them. Cabo Segundo Ametralladorista Julio Omar Benitez died while firing the planes. Cabo Segundo Maquinista José Raúl Ibañez took his place in the machine gun . (La Prensa, May 19th, 1992) (24) . Foreman Juan José Baccaro was hit by shrapnel in his spine, lungs and left leg (he still keeps 61 fragments in his body). Cabo Segundo Alberto Bengoechea received a grapeshot in his left thigh. An Army soldier received a hit which lodged few millimeters from the thoracic aorta. The Cabo Segundo Enfermero Oscar Guzman had to treat seriously wounded people. Another coastguard, ‘Islas Malvinas’ was attacked as well by a British Sea King. The majority of the Argentine casualties resulted from ground actions supported by artillery and naval gun fire. It should be said that Mount Longdon, Mount Tumbledown and Goose Green were bloody battles which ended with fixed bayonets and hand-to-hand fighting. Mount Longdon was organized on company “B” of the Army´s 7th Regiment `Coronel Conde´, well known as the regiment which liberated Chile from the Spaniards. It was reinforced with mortars, a section of engineers and another of Marine Corps. They faced the British 3 Parachute Regiment. The Argentines had 36 deaths and 84 wounded. At one point during the attack, an entire British company was held up for hours by a single Argentine sniper. After 10 hours Mount Longdon was in British hands but after paying a high price. When the day broke 18 Paras and an attached Royal Engineer were killed and 47 were injured. Three more Paras and a REME craftsman were killed in the subsequent shelling. Brigadier Julian Thompson said `I was on the point of withdrawing my Paras from Longdon. We couldn`t believe that these teenagers disguised as soldiers were causing us to suffer so many losses´ The 7th Regiment could manage to expatriate their war flag. The 2nd Scots Guards seized Mount Tumbledown after a fierce battle against the 5th Marine Corps Battalion ( BIM5 ) (707 men) considered by the British as probably the best Argentine unit. The Marines received 1000 rounds per hour from 54 firearms placed West, fire from 3-5 ships placed North and South and air attacks from planes and helicopters. Argentines suffered 16 deaths and 64 wounded. Mount Tumbledown was captured at the cost of 9 British lives and 32 wounded . Argentine troops presented 290 cases of trench foot (164 were from the Army ) after an exposure of 65 average days to adverse conditions. The BIM 5 presented only one case of trench foot ( it required the amputation of his right big toe ) after an exposure of 71 average days. The British presented 70 cases of trench foot after an exposure of 24 average days. The Argentine Army had 14 cases of malnutrition and the Marine Corps one. There were some cases of diarrhoea among the 3 Commando Brigade Royal Marines who fought in Mount Harriet. In Two Sisters. the 45 British Commando suffered a friendly fire clash between their mortars and a patrol mistaken as Argentine. According to Major José Yofre (Argentine Army ) in Puerto Argentino there were 195 deaths : 1 Officer every 2 Petty Officers and every 9 conscripts. Of the 9,804 soldiers in Puerto Argentino died 1,99% of the total ( In Vietnam 1,11% ). b) The use of phosphorous munitions (both by British forces). Both cases “clearly contradicting the principle of proportionality” (5). The term desmalvinización was coined by the french politician Alain Rouquié and was to be used in different symposium since june 1982 (7). d) Mixing the involvement in the South Atlantic conflict with the political and social upheaval the country was experiencing at that time. Officer Barry Elsby published an interesting observation on high rate of male breast cancer in Malvinas. (British Journal of Hospital Medicine, 1993, Vol 49, Nº 11). Acute stress disorder is not always followed by PTSD. Hyperarousal for at least one month. Symptoms of hyperarousal refer to physiological manifestations such as insomnia, irritability, impairedconcentration, hypervigilance and increased startle reactions. The diagnosis iseasily missed as sometimes there is an overlap with depression or other anxiety disorders. TSD may appear between 3 weeks and 30 years after the traumatic episode (Davidson JRT in Sinopsis de Psiquiatría-Kaplan H., Sadock B-Edit.Intermédica Bs As 1995). PTSD can become a chronic psychiatric disorder that can persist for decades and sometimes for a lifetime marked by remissions and relapses. The immediate precipitant is a situation that resembles the original trauma in a significant way (a war veteran whose child is deployed to a war zone). 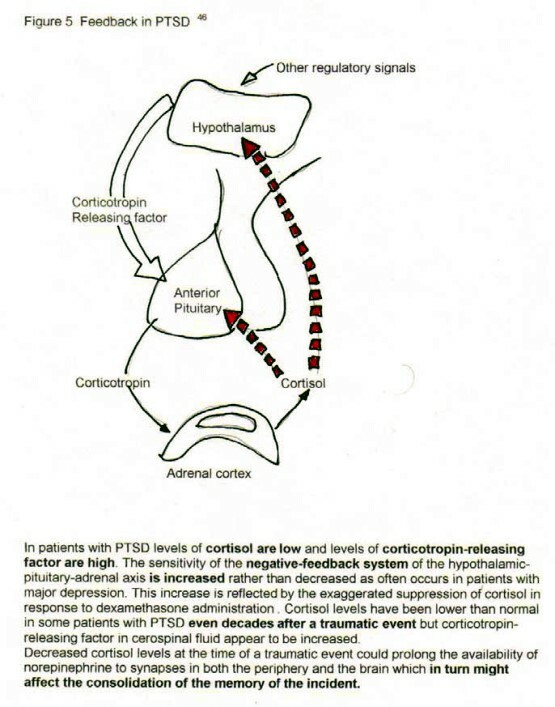 (Friedman, Matthew-Post-Traumatic Stress Disorder: An Overview, Darmouth Medical School ). PTSD can be measured through the Mississipi Scale for PTSD (combat and civilian version), Clinician Administered PTSD Scale for DSM IV and portions of the Minnesota Multiphasic Personality Inventory. The US National Institute of Mental Health considers that 30 percent of men and women who have spent time in war zones experience PTSD (1,000,000 war veterans in Vietnam). A group of 64 British war veterans who were still serving in the British Army were studied by O’Brien et al and compared with a group of matched controls. Half the veterans reported some symptoms of PTSD and 2% were rated as having the complete PTSD. Presence of the symptoms was associated with intensity of combat experience and the retrospective report of emotional difficulties in the initial period of return from the war. Tables 11 and 12 (30). 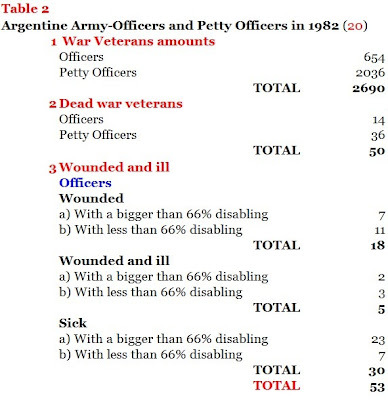 There were no Royal Army Medical Corps psychiatrists in the Malvinas war (Price HH-J R Army Med Corps 1984;130:109-113). Interpersonal violence gives rise to PTSD more often than natural disasters. The unexpected death of a loved one makes this event the single more frequent traumatic event to occur in both men and women accounting for 39 percent of cases of PTSD in men and 27 percent of cases in women. According to the US National Center for PTSD, 25-75% of survivors of abusive or violent trauma report problematic alcohol use. this is associated with a chaotic lifestyle, which reduces family emotional closeness, increases family conflict and reduces parenting abilities. Table 13. A direct link between a particular traumatic stressor and a specific crime can be evidenced. Crimes at times literally or symbolically recreate important aspects of trauma. Environmental conditions may be similar and finally life events immediately preceding the offense can realistically or symbolically force the individual to face unresolved conflicts related to the trauma. Increased circulating levels of norepinephrine. Increased reactivity of adrenergic receptors. Increased levels of thyroid hormone. Increased reactivity of the amygdala and anterior paralimibic region to trauma related stimuli. Decrease activity of anterior cingulate and orbitofrontal areas. Differences in hippocampal funcion and memory processes dependent of the hippocampus. According to a study by Tim A.Bullman and Han K.Yang in the Federal Practitioner (12) (3):9-13 (March 1995) “no more than 20,000 Vietnam Veterans died of suicide from the time of discharge through the end of 1993”. 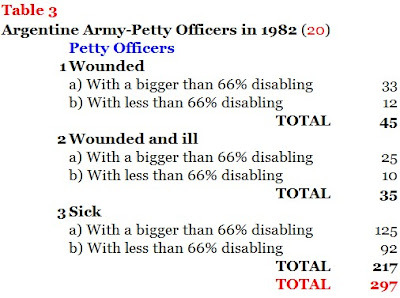 Notwithstanding, in Chuck Deans´book Nam Vet the author states that “Fiftyeight thousand plus died in the Vietnam War. Over 150,000 have committed suicide since the war ended”. Mr. Dean was the executive director of Point Man International a Seattle based, non-profit support organization dedicated to healing the war wounds of Vietnam Veterans. According to a VA doctor the number of suicides was 200,000 men and the reason the official suicide statistics were so much lower was that in many cases suicides were documented as accidents, primarily single-car drunk driven accidents and self inflicted gunshot wounds that were not accompanied by a suicide note or statement. In the end was a primarily an act of kindness to the surviving relatives. The Suicide Wall web site is an attempt to determine how many Vietnam Veterans have actually taken their own lives, as well as a place to memorialize and honor those who served their country, and finally a place which may serve to help prevent suicides in the future. According to Héctor Beiroa President of the Argentine Federation of Malvinas War Veterans there have been 264 veterans committing suicide since 1982. There are no official data of suicides neither from the Argentine Federation of War Veterans nor from the Province of Buenos Aires Federation of War Veterans. According to Ruben Rada, President of a Malvinas War Veterans Centre, in 1995 they´ve got in contact with an statistics from the Campo de Mayo Army Hospital informing about 236 cases. They´ve been updating such figure ever since. In the city of Buenos Aires, according to the National Institute of Statitics and Census (INDEC), between 1986-1990 there was a 30% increase of suicides. An update research using the judicial morgue showed 333 cases in 1991 and 499 cases in 1994 (near a 50% increase) (Rodriguez Garin, Eduardo Dr et al-Suicidios consumados por pacientes psiquiatricos-Alcmeon- Año VIII-Vol 6- Nº1, Junio 1997). In Argentina in 1992 there was a peak of 12 suicides per day in people 20-24 years old. In 1996, Argentina had a males suicide rate of 9.9 per 100,000 . Each suicide directly affects ten people and indirectly affects a further 50. Seven men who served in the Falklands killed themselves in 2001. One Falkland Military Association official said that the figure of suicides was half of that for the number who went to war. Post-war suicides put the figure of more than 100 (South Atlantic Medal Association –SAMA). In 1996, the UK had a males suicide rate of 11.7 per 100,000. A guardsman who survived the Bluff Cove Sir Galahad Disaster was forced to sell his cooker only days before he hanged himself. Another Welsh guardsman hanged himself in his father´s home last Sunday symbolically (16). According to Denzil Connick (one of SAMA founders), the cause would be in part the tendency of the soldiers of hiding their feelings and the lack as well of means to face the post traumatic depression of war veterans. Table 14 shows the steps that have been taken since 2001 at the INSSJP Medical Area by the author’ s team. 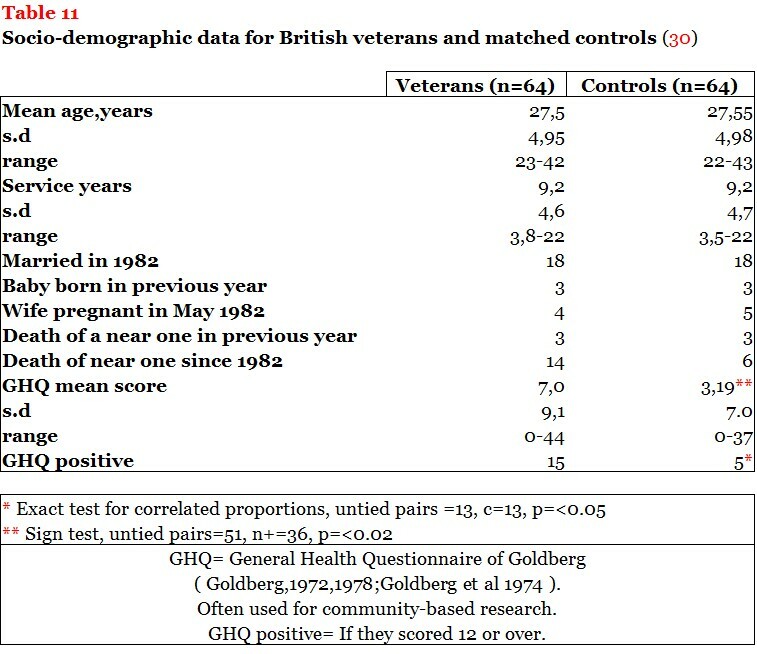 The only way to ascertain the true prevalence of psychiatric casualties of the war among serving soldiers and their relatives is by epidemiological studies (Jones GH- J R Coll of Gen Pract, Jan 1987). Notwithstanding two elements conspire against this last: the soldier’s reluctance and inaccuracies. One of the few clinics in the UK that specialize in treating traumatised ex- service men and women is Ty Gwyn nursing home in Colwyn Bay, north Wales. Dr Dafydd Alan Jones has treated in the past 10 years more than 2,000 ex-servicemen suffering from post traumatic stress disorder (PTSD), many of whom have fallen into dire straits because of the lack of specialized care. Malvinas War Veterans ad honorem works for the community Malvinas war veterans have helped the victims of floods in the Provinces of Chaco, Corrientes, Entre Ríos and Santa Fe. They’ve helped to extinguish fires in the Amazonas (Roraima state in Brazil) and participated in the reconstruction of two damps (Campo Gallo in Santiago del Estero). The war veterans assisted in the patagonic reforestation and in the struggle against cholera, Chaga’s disease and HIV infections. They’ve served dining rooms for old people under extreme poverty in Corrientes and Chubut. The Argentine Republic Malvinas War Veterans Federation was founded in 1990 and gathers 135 veteran`s centers. It works very closely with the Veteran’s INSSJP Managership . 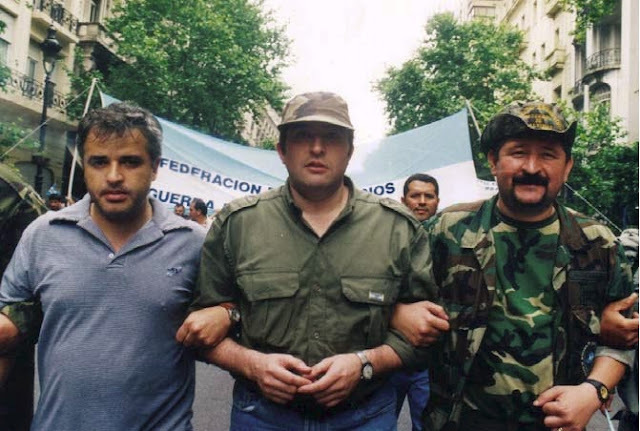 The National Coordinator of Former Malvinas Combatant`s Centers controls the organizations of Great Buenos Aires (4709 Veterans), La Plata, Mar del Plata and the provinces of Corrientes and Chaco. The 1995 research over 145 war veterans showed that 36.6% had disintegrated families with abandon of one or two parents. A great amount (35%) of their fathers died immediately after the Malvinas war thus increasing the veteran’s sense of guilt. About 64% belonged to a low income class. According to a 1997 research 25 to 39% suffered of PTSD and 88% of them never attended a health center (4) . 74 % suffered discrimination when searching a job (20). Only 12 % owned a property and 35% lived in precarious situations. They felt shame and rejection (‘Only the good guys didn’t return’) (25). Today war veterans have a 70% unemployment rate (Argentina has a 22% unemployment rate). Since 1998 about 11,680 war veterans have joined the benefits of the INSSJP health and social network. Their medical assistance is considered in National Laws 24.736/96 and 25.210/99. The hospital fee exemption is considered in the Buenos Aires Municipal Decree 4475/82. They have obtained the following benefits between 1982 and 1999: 13 National Laws and 3 Decrees, 4 Laws and 2 Decrees in the Province of Buenos Aires and 7 statutes in the Capital city. About 13,800 have a National Life Pension and a Provincial Life Pension whose amount varies according to the Province. Besides there are 70 of them working nationwide at the INSSJP. The rest remain in active duty, are liable to receive retirements and have the social benefits of their Armed Forces. There have been some very successful veterans as the well known tenor Dario Volonte, a survivor of the General Belgrano, and Osvaldo Omar De Felippe a soccer player of Huracan team and veteran of the Army 3rd Regiment of La Tablada. (Clarín 7/2/98 and 11/5/99). Emotional Reactions: Family members feel hurt, frustrated etc. Difficult communication with the war veteran. Overinvolvment with their children´s lives: The war veteran suffering from PTSD may become overinvolved with their children´s lives due to feeling lonely and in need of some positive emotional feedback or feeling that the partner can´ t be counted on as a reliable and responsible parent. The relative may be abused, frightened and betrayed. The war veteran´s addiction may give rise to domestic violence problems. Suicide: PTSD are more prone to contemplate and attempt suicide than similar people who have not experienced trauma. This places an unavoidable stress on families. The Mission, Objectives and personal responsability of the War Veteran’s areas placed in every INSSJP delegation were submitted to the central authorities. The nationwide war veteran’s medical profile requirements were presented to the central authorities who deal with different clinics and Hospitals. The few war veterans who work at the area attended an intensive course of Health Promoters at the Buenos Aires University thus multiplying the prevention and assistance of their own comrades. Besides the author, a Licentiate in Psychology ( wife of a war veteran retired Navy Officer ) and war veterans Health Promoters dictate courses in the different provinces to professionals, war veterans and their families on PTSD etc which involves a feed-back process. An agreement has been submitted for a free psychological assistance to War veterans by the ‘John Fitzgerald Kennedy ‘ University ( Buenos Aires ). A free phone call line for psychiatric emergencies is already working organized by the Province of Buenos Aires War Veterans Association. The INSSJP Health Area is organizing such facility nationwide through the FACAP ( Argentine Federation of Psychiatric Chambers and Associations). A centralized painstaking national monthly follow-up is being made of all the office hours medical assistance and surgical procedures to which war veterans and their families have been submitted. BBC News-The Battle over the Falklands-Sunday, October 25,1998. Bluth,Christoph ´British Resort to Force in the Falklands Conflict´-Journal of Peace Research-Vol 24,No1,1987. Corddry, Charles W ´Britain´s Near-Thing Victory´, Air Force, December 1982, pp 50-53. Duffner,Robert W-Historian of the US Air Force Weapons Laboratory, Kirkland AFB, New Mexico-Conflict in the South Atlantic: the impact of air power-Air University Review. La Guerra de las Malvinas-Editor José Juan Fernandez Reguera, Buenos Aires Argentina. Myers,Kevin-An Irishman´s Diary-The Irish Times on the web-Thursday,July 26,2001. Programa de Investigación y Acción Participativa sobre la Salud del Veterano de Guerra y sus Familiares- Subgerencia de Veteranos de Guerra- Instituto Nacional de Servicios Sociales para Jubilados y Pensionados- Buenos Aires, Argentina. Robaccio,Carlos Hcontraalmirante y Hernandez,Jorge Suboficial Mayor- ´Desde el Frente, Batallón de Infantería de Marina Nº5´-Editorial Solaris. Trainor,Bernard E. Lt Gen USMC (Ret) Reflections on the Falklands-Marine Corps Gazette-Jan 1989. Wood,Derek and Mark Hewish ´The Falklands Conflict-Part I:The Air War´ International Defense Review, No 8/1982, pp 977-80.